The 206 bones that compose the adult skeleton are divided into five categories based on their shapes ([link]). Their shapes and their functions are related such that each categorical shape of bone has a distinct function. Bones are classified according to their shape. A long bone is one that is cylindrical in shape, being longer than it is wide. Keep in mind, however, that the term describes the shape of a bone, not its size. Long bones are found in the arms (humerus, ulna, radius) and legs (femur, tibia, fibula), as well as in the fingers (metacarpals, phalanges) and toes (metatarsals, phalanges). Long bones function as levers; they move when muscles contract. A short bone is one that is cube-like in shape, being approximately equal in length, width, and thickness. The only short bones in the human skeleton are in the carpals of the wrists and the tarsals of the ankles. Short bones provide stability and support as well as some limited motion. The term “flat bone” is somewhat of a misnomer because, although a flat bone is typically thin, it is also often curved. Examples include the cranial (skull) bones, the scapulae (shoulder blades), the sternum (breastbone), and the ribs. Flat bones serve as points of attachment for muscles and often protect internal organs. An irregular bone is one that does not have any easily characterized shape and therefore does not fit any other classification. These bones tend to have more complex shapes, like the vertebrae that support the spinal cord and protect it from compressive forces. Many facial bones, particularly the ones containing sinuses, are classified as irregular bones. A sesamoid bone is a small, round bone that, as the name suggests, is shaped like a sesame seed. These bones form in tendons (the sheaths of tissue that connect bones to muscles) where a great deal of pressure is generated in a joint. The sesamoid bones protect tendons by helping them overcome compressive forces. Sesamoid bones vary in number and placement from person to person but are typically found in tendons associated with the feet, hands, and knees. The patellae (singular = patella) are the only sesamoid bones found in common with every person. [link] reviews bone classifications with their associated features, functions, and examples. Bones can be classified according to their shapes. Long bones, such as the femur, are longer than they are wide. Short bones, such as the carpals, are approximately equal in length, width, and thickness. Flat bones are thin, but are often curved, such as the ribs. Irregular bones such as those of the face have no characteristic shape. Sesamoid bones, such as the patellae, are small and round, and are located in tendons. Most of the bones of the arms and hands are long bones; however, the bones in the wrist are categorized as ________. Sesamoid bones are found embedded in ________. Bones that surround the spinal cord are classified as ________ bones. Which category of bone is among the most numerous in the skeleton? Long bones enable body movement by acting as a ________. What are the structural and functional differences between a tarsal and a metatarsal? Structurally, a tarsal is a short bone, meaning its length, width, and thickness are about equal, while a metatarsal is a long bone whose length is greater than its width. Functionally, the tarsal provides limited motion, while the metatarsal acts as a lever. What are the structural and functional differences between the femur and the patella? Structurally, the femur is a long bone, meaning its length is greater than its width, while the patella, a sesamoid bone, is small and round. Functionally, the femur acts as a lever, while the patella protects the patellar tendon from compressive forces. 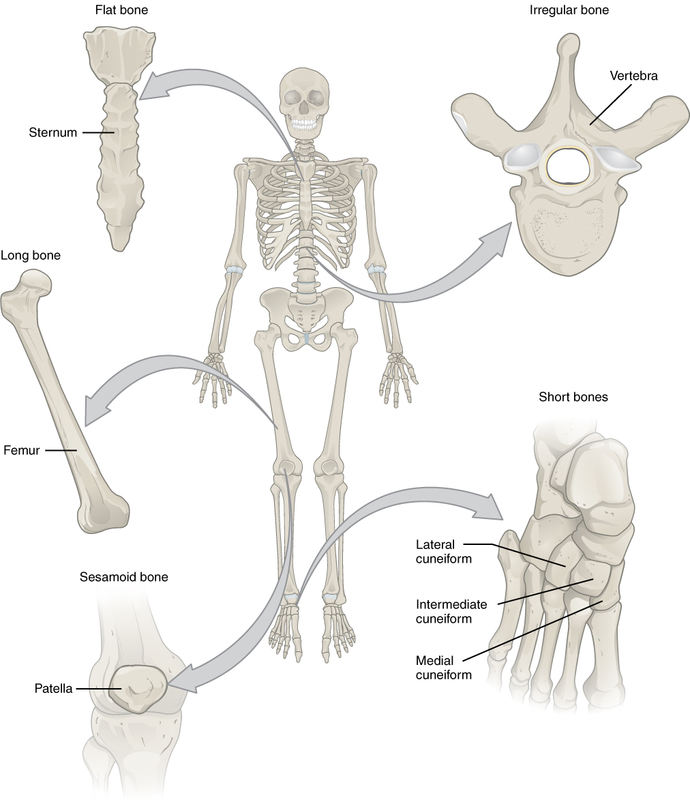 Bone Classification by OpenStaxCollege is licensed under a Creative Commons Attribution 4.0 International License, except where otherwise noted.